A unique expertly curated blend of the finest CTC Assam black teas blended with natural bergamot oil and fresh Indian spices like Cardamom, Cinnamon, Clove & Black Pepper. 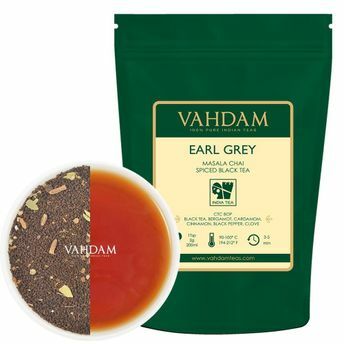 This Earl Grey Masala Chai spiced black tea offers a distinctive medley of rich citrusy notes with delightful sensations of tangy spices to make for a delectable cuppa which can be served with or without milk. Manufactured from 100% natural ingredients, the original flavours of each ingredient in the tea plays a crucial role in the overall experience. Add sugar or honey to sweeten the cuppa. Also makes for an excellent breakfast tea.